Did you graduate college only to be saddled with tens of thousands in student loans? You're entering your new adult life full of freedom and opportunities. But you're entering it weighed down with debt before your first paycheck. Nearly 70% of students graduate with education debt, and the average student loan amount totals over $37,000. This is a huge burden to take on, and we know you'll want to unload it fast. Pay off the loan with the highest interest rate first. Increase your payments. If possible, make prepayments on the principle. Plus, the longer you're carrying around this debt, the longer you put off making any progress on other lifetime goals. For instance, saving for retirement, buying your first home, or preparing for marriage. Adult life is full of freedom and opportunities. With the tips in this article, you'll be able to put those student loans behind you. Tip: Do you have too much student loan debt? You can change that. Find out here. Repaying loans off as quickly as possible can help you free up some extra cash in your budget. It can save up to thousands of dollars in potentially high interest. All it takes is discipline and a better repayment strategy. 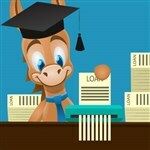 Thinking of Refinancing Student Loans? Before we get started, it's helpful to know exactly where you stand on your student loans. Know exactly how much you owe. Know what your interest rates look like. Set goals for payoff dates. This will help you make a plan. Use this Student Loan Repayment Estimator to figure out where you stand. Read on to learn about 24 things you can do to say goodbye to your debt sooner. We split the information up by type of loan, but many tips apply to both, so make sure to read everything. Federal loans make up the bulk of student loan debt in the U.S., including loans taken out by students and PLUS loans owed by parents. Federal student loan borrowers are typically granted a grace period before their first payment is due, during which time no interest accrues on your subsidized loans. It may be tempting to not pay anything at this time (especially if you're just getting your footing in an entry level job). But throwing even an extra $20 a month at your debt reduces your interest first and then principal which shaves some time off your repayment period. Are you temporarily struggling with federal student loan payments? Keep in mind that the federal government does not want you to default on payments. There are multiple options such as forbearance, deferment and a slew of repayment options. Forbearances can be used in times of hardship. Deferments are meant to be used when you suffer from a job loss or are still attending school. Be wary of repayment plans. Income-based repayment plans (IBR) were introduced to offer relief to cash-strapped students who couldn't afford to pay under the standard 10-year plan. These plans lower your monthly payment, but lengthen your repayment term. And our goal here is to pay off the loan fast. If you do require an income driven repayment plan there are several options available to you. Log in to your student loan servicers website or the Department of Education submit your current income and family size and it will provide you with a new low repayment option. Consider this only if you are having trouble making the minimum payments. Otherwise, it's much better to save and find extra money to pay off the loan as fast as possible. Consider a career in public service. Under the public service loan forgiveness program, any remaining balance you owe would be canceled after you've made 10 years' worth of payments. This can be a major plus if you borrowed heavily to complete your education. Also consider working for a service program that offers loan forgiveness or an education grant. Programs under the Americorps umbrella will often offer an education grant in exchange for 1-2 years of service. Check out this full list of grants that can also help you take care of those loans. Make your monthly payments automatic. Opting to have your monthly student loan payments drafted right out of your bank account is an easy way to reduce what you're paying in interest and get out of debt faster. Many loan servicers offer a 0.25% interest rate reduction for any borrower that enrolls in automatic payments. Pay before the due date. Your federal loan servicer will assign you a specific due date each month, but getting your payment in earlier can work to your advantage. The interest on your federal student loans are calculated daily. Making your payments ahead of the due date reduces the principal faster and cuts the amount of interest you're being charged, so you're not stuck paying as long. You can use the repayment estimate calculator to view how much you can expect to pay back. Keep in mind: While you are taking classes any payments that you make on your subsidized loans will apply directly to principal. As an undergrad swapping a daily coffee for a payment on your loans can save you hundreds on interest over their lifetime. Repaying your loans early will not only help cut down on interest and reduce payments, but can help you save up for and purchase your first home. Splitting your monthly loan payment in two is another easy strategy for eliminating the debt more quickly. For example, if you owe $30,000, your monthly payment would be around $300 on the standard 10-year plan. If you broke that up and paid $150 every two weeks, you'd shave a whole year off your payoff time and around $700 off the interest. Consolidate to a lower rate. If you're juggling multiple federal loans, consolidating them will take them and combine them into one new loan. This can streamline your monthly payments and potentially lower your interest rate. Rates are fixed for the life of the loan, and you still have the option of going with an income-based repayment plan if you need to. There are pros and cons with this process, so make sure to do your research to see if this is the best option for you. Tip: Keep in mind the difference between variable and fixed interest rates. Knowing your rate and knowing how much accrues daily can ultimately save you money on the long run. A fixed rate will remain the same and a variable rate will change depending on the current market. Of course, both will change if you apply for a consolidation or loan refinancing. Get tuition assistance from your employer. 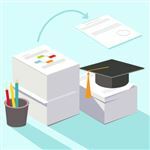 Many private companies offer tuition assistance or reimbursement to employees who are either attending grad school or have earned their degree. The federal government also sponsors loan reimbursement programs for teachers and nurses who work in underserved communities. When you've maxed out your federal student loan eligibility, turning to a private lender may be the only way to finance your degree. Unfortunately, private loans typically lack the low interest rates and range of repayment options that federal borrowers enjoy. Start with the most expensive loans first. Private student loans tend to carry much higher interest rates than federal loans, with some capping out at 18%. Therefore, it's a good idea to target the private loans over federal loans. Getting the smallest loan balance out of the way first can give you a sense of accomplishment, but paying down the one with the highest interest first will ultimately save you the most money in the long run. Try this strategy: pay as much as you can on the loan with the highest interest, and just the minimums on all the others. Once that first loan is paid off, roll over the payment amount to the next loan with the second highest interest. Refinance with a different lender. If you're carrying higher rates on your private student loans, refinancing them with a different lender can lower your interest rate. There are both fixed and variable rate loan options available (with rates as low as 2.13%), and most lenders will allow you to refinance both undergraduate and graduate school loans together. Tip: Having multiple loans with different interest rates is a major headache. What if you just had one loan at one rate? Refinancing can consolidate your loans into one easy payment. Shop lenders at Credible. Take advantage of a 0% credit card offer. When refinancing your private loans isn't an option, you can shift some of the balance to a zero-interest credit card. Keep in mind there are also credit cards geared directly at college students, read here to find out more. Credit card companies routinely use 0% promotional offers to attract new customers. Taking advantage of this can give you a breather from higher interest rates. But before you take this action, make sure you have a plan in place to pay off the balance before the promotional period ends. Otherwise, you will be stuck with an interest even higher than that of student loans. Most people don't know that you are able to pay off student loans with credit cards. But I wouldn't recommend people to do this at all. Credit cards potentially have higher interest rates than federal student loans. Therefore, it wouldn't make sense to risk transferring the low-interest debt to high-interest credit cards and forfeit student loan protections. You can risk giving up deferment, forbearance, consolidation, or loan forgiveness options by going this route. Paying off your student loans with credit cards is a bad idea for most people. Bump up your payments incrementally. Paying more than the minimum each month is the easiest way to get out of debt faster. But we know it's not always possible to add on a big chunk of change to your payments. Try just increasing your payment by $10 or $20 to start, which isn't likely to bust your budget. As you earn more at work or trim your budget in other areas, slowly start to put more in the extra payments. Make sure payments are applied correctly. Paying extra on your private loans won't speed up your debt payoff if your lender doesn't allocate the money correctly. Pay very careful attention to this. Instead of applying it to the principal, your lender may credit it towards your next month's payment, which won't do much to reduce your interest or make a dent in the balance. Specifically ask to avoid "Paid Ahead" status to ensure that your progress isn't slowed down. If you borrowed heavily from private lenders, relocating to a cheaper city can make managing your payments easier. Some places even offer additional incentives to entice new grads. Places like parts of Kansas and Detroit, for example, have programs that provide loan reimbursement for borrowers who are willing to pick up their roots and try out a new city. Digging your way out of student loan debt becomes a lot easier if you're willing to consider some creative solutions beyond just the basic repayment options. Use your credit card rewards. Reward points and cash back are good for more than just shopping or travel. You can also use them to pay off your student loan debt. If you received a tax refund, slapping it down on your student loan is the smarter option than spending it on a shopping spree. For example: if you owe $30,000 in loans, putting an extra $3,000 (the average yearly tax refund) towards the balance all at once would get you to the debt-free finish line a full two years faster. Imagine how much faster you will pay off your loans if you do this every year. Consider a career in the military. Military service offers an incredible number of benefits, the most important of which is the opportunity to serve your country in an invaluable way. Alongside that honor, you can also receive a number of loan repayment or education sponsorship benefits. Find areas where you can cut down on costs. Trimming your budget is one of the most effective ways of clearing up extra cash to use towards student loan payments. This is not as hard as most people think. Try out a budgeting app like Mint to see where your money is going each month. Is your high rent eating up a good portion of your paychecks? Consider shacking up with a roommate or two. Food costs can also be cut drastically by cooking your meals and bringing your lunch to work. Cancel any "luxury" unnecessary items such as cable TV, gym membership, or daily Starbucks runs. Really, the options are endless. Tip: If you don't mind moving back in with the parents after graduation for just a short while, you can make serious headway in paying off your student loans. Your parents would also have to be on board and keep you accountable. The trick is to use what you would have spent on rent and bills on your student loans. This could be anywhere from $700 - $1500 per month depending on your city. And have a solid plan to move out after an agreed upon timeframe. Taking surveys online is a quick, painless way to pick up a few extra dollars. Both My Survey and Survey Spot pay out rewards that you can then convert into an extra student loan payment. Who knew sharing your opinions could be such a money maker? Increasing your income can help you pay off your student loans faster, but that doesn't mean you have to switch careers or get a second job. You just have to be willing to put in some time. Starting a side hustle, whether it's freelancing, pet sitting, or selling your old stuff on eBay, is an easy way to bring in a few extra bucks each month that you can put towards your loans. If you're not keen on the idea of working on the side, consider donating plasma or join a clinical study to pull in some extra cash. Additionally, one of the most overlooked ways to increase your income is to just simply ask for raise at work. Do your research and explain why you think you deserve one. You'd be surprised at what you can get just by speaking up. Let an app do the work. If you're having trouble finding extra money in your budget to pay your loans, your smartphone may hold the solution. Digit is a new app that links to your bank account and scans your spending patterns to look for money you can save. The app transfers the money automatically to a separate savings account, and you can easily move it back to your checking when you're ready to apply it to your loans. If your parents or grandparents still give you cash for birthdays or holidays, asking them to redirect the money towards your student loans can get you out of debt faster. LoanGifting, for example, offers a student loan gift service that looks a lot like GoFundMe, but is completely dedicated to student loan repayments. This allows donors to apply money to your loan balance with just the click of a button. Many states have investing plans for family members to contribute towards education expenses. You should check the programs in your state and talk with family members about options. Tax season isn't a ton of fun for anyone, but being able to deduct $2,500 of your student loan interest makes it easier. If you went to an accredited university and meet some other requirements you can take advantage of the tax deduction, then turn around and use that money to pay down your loans. There are several tax credits for college students and graduates such as the American Opportunity Credit, and Lifetime Learning Credit along with the interest deduction. Make sure to speak with a tax professional to make sure that you get the most of benefits that are available to you. Take advantage of a loan discharge. You may not be aware, but there are ways to get your student loans discharged. You may be eligible if you attended a school that closed, or was falsely certified, and your degree does not mean what you thought. Under certain instances of bankruptcy or through a specific disability occurring after your degree may result in loan discharge as well. Paying off student debt takes a lot of discipline and hard work, of course. Luckily, you're an intelligent person, and now you have the diploma to prove it. The bottom line is to throw whatever extra money you can manage to earn or save towards your loans. Yes, paying off debt will take sacrifice, but remember that it's not something you have to do for forever. So stay motivated and keep a clear understanding of the end goal: financial freedom. Subsidized loans give you an interest break, but there are limitations. Unsubsidized loans allow you to borrow more, but you'll pay more interest. Find out what you qualify for. Student loan forgiveness is real. There are several income-based repayment plans and jobs that offer loan forgiveness. Read on to get started. Student loan debt is a giant pit of quicksand that swallows up millions of grads each year and doesn't spit them out until many years — even decades — later. Share on Facebook "Best Ways to Pay Off Student Loans Fast"